Printed satin ribbons are used basically in creating ribbons and bows and for tying up gift packages, especially for children. Pets considered being a part of our families and our memories if we have. Whether they are dogs, cats, hamsters or rabbits, they improve our lives. Creating a pet-themed scrapbooking album will preserve the special moments you share with them. You can use these satin ribbon animal ribbons that make your craft work fantastic and add beauty to your project. At our online shop these ribbons that are available in multiple animal prints which are exciting and totally different from others. Varieties that we have at our online store are Tiger, Dalmatian dots, Zebra Black and Leopard to name a few. Variations in different colors provide a unique dimension to each of these ribbons. 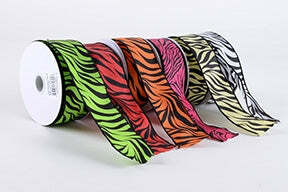 If you want to give a unique look to your craft project or your creation, then use our satin ribbon animal prints.